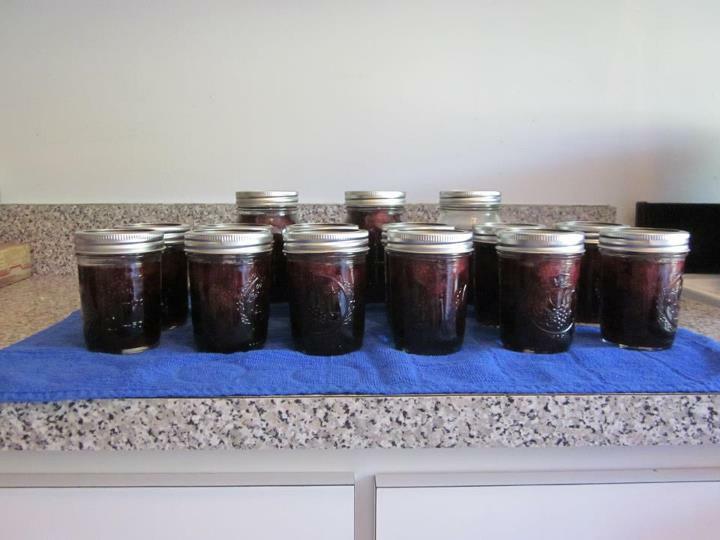 Guest Post: Three Canning Recipes From My Sister, D.
Ed. Note: Lately, as I’ve been doing my own series on how to preserve summer produce, I’ve received a lot of questions about canning. I’m not a canning expert and have never tried my hand at it, but my sister, D. — who, in her day job, is a highly respected ancient historian and celebrated professor who enjoys wine, music, sustainable food, and speaking Franglais — took up the art a few years ago and is now my own personal canning guru. She graciously agreed to take over this page tonight and share some basics with you all. So without further ado, allow me to introduce my inimitable and much adored sister, D.
So when my sister asked me to write a guest post for her blog, I was both extremely flattered and very apprehensive. I’m an academic, people. Sure, I do a lot of writing in my job, but generally it involves incomprehensible sentences chock-full of polysyllabic words and sprinkled liberally with footnotes. Lots and lots of footnotes. It’s all I can do not to add one here. I certainly can’t hope to match the wit and wisdom of my sister. So I just hope y’all won’t be too bored. Seriously, I would never take on B.’s food blogging duties. For one, I live alone, and generally cook only to please myself. I flatter myself that I’m a pretty good cook, and I’m certainly interested in food politics, organic farming, and the like, but I don’t invest the time and energy into meal planning, shopping, and sheer creativity that she does. If I eat pasta four nights in a row, who cares? The only one who’ll know is the cat, and she’s not telling. Besides, B. can bake me under the table with one hand tied behind her back. I’ve already requested my birthday treat for this year, although I doubt it will top last year’s talking muffins. One thing I do do in the kitchen that B. doesn’t, however, is canning. I’ve no doubt that in a year or two, when L. and P. are in school full-time, I’ll lure her over to the dark side, but until then I’m on my own here. And since she’s been getting a lot of canning questions lately, she asked me to chip in with some of my favorite tips and recipes for preserving the best foods of summer. The first thing I want to say is that canning is not nearly as intimidating as most people believe. We have this mental image of flushed, sweaty women in aprons hovering over steaming pots for days in the middle of summer, surrounded by piles of produce and pyramids of glass jars. Sure, there can be some of that – canning can take place on whatever scale you want it to, and if you have 14 acres of zucchini, I’m not judging you – but increasingly there are recipes for small-scale canning, many of which can be done in the smallest of kitchens (I live in Brooklyn, for God’s sake. My kitchen is smaller than most people’s closets) and with a relatively minimal investment of time. Nor do you have to invest a ton of money. Ball jars are cheap and readily available, and you can get a basic canning kit, complete with recipe book, at many hardware stores or online for less than $75. My personal favorite recipe guide is Well-Preserved: Recipes and Techniques for Putting Up Small Batches of Seasonal Foods by Eugenia Bone, but the Ball Blue Book (which comes with many canning kits) is also great. It doesn’t even have to be all that complicated. Preserving in jars comes in two varieties: boiling-water canning and pressure canning. Boiling-water canning is generally where most people start, mainly I think because you don’t need a pressure cooker/canner to do it. The difference between the two depends on the pH value of the product. Low acid foods – most vegetables, meats, fish, soups, etc. – need either to have acid added or to be pressure-canned, to make sure all the bacteria are killed. Other foods, such as fruits, jams, and some tomato recipes, have enough acid in them so that they can be accomplished simply by processing your filled jars in boiling water, which will raise the temperature of the contents enough to kill any nasty organisms. But one thing you have to do is follow the recipe and the directions, both to make sure the jars seal properly and to make sure that you have the appropriate acidity level and processing time to render the finished product safe for storage. Luckily I’m good at reading and following instructions, so this is right up my alley. I have never – not once – had a jar not seal properly, although I have friends who have had a dud here or there. Some helpful hints before I get to sharing a couple of my favorite canning recipes (although I’m going to stick to boiling-water canning for right now; if my sister asks me back, who knows?). First, lay out everything you’re going to need – ingredients, jars, tools, etc. – before you start. In cooking this is called mise en place, and it speeds things up exponentially. In canning this is a matter of survival, as you don’t want to be juggling scalding-hot jars when you’re reaching for your tongs, or worrying over the rapidly-cooling contents of your jars while you wait for the sealing rings on your lids to soften. I read all my recipes, even the ones I’ve made multiple times before, through at least twice before starting the process. Second, the quality of what you put into the jar results in the quality of the end product. Sure, you can process up the tomatoes that are half-rotted, munched on by bugs, or sort of sickly looking (and I know people who do), but for me the whole point is to preserve the best of the summer’s produce so that when you’re making sauce in the middle of January, you don’t have to resort to tomatoes that are pale orange, have a carbon footprint the size of Alaska, and taste like Styrofoam. Third, I always have at least one extra jar and lid combo on hand, sterilized and ready to go when I’m canning. The guidelines on what the recipes make are a “best guess” sort of thing; if your produce had more water, or if it didn’t cook down quite enough, or any number of other things, you might end up looking at enough perfectly good food in the bottom of your pot to fill an extra jar or two, and it’s just a shame for it to go to waste. OK, ready? Here we go: crushed tomatoes, strawberry-balsamic “jam” (I think it’s more like a compote, but the recipe calls it jam), and blueberry pie filling! 1. Score the bottom of your tomatoes with an X. Bring a large pot of water to a boil. Drop the tomatoes into the boiling water for 10 seconds and then remove. The skins will now remove easily. Drop the skins into a colander set over a large bowl. 2. After you have peeled the tomatoes, core them and slice in half. Squeeze out the seeds over the colander with the skins (a lot of tomato juice is saved this way. Eugenia suggests either adding it to the canning process or using it for Bloody Marys. I add it to my tomatoes). 3. Add the peeled, seeded tomatoes to a large pot. Crush the tomatoes using a food processor, potato masher, or just your hands. A few chunks are fine. Heat the crushed tomatoes and boil gently for 5 minutes; if they get a bit foamy on top don’t worry. 4. 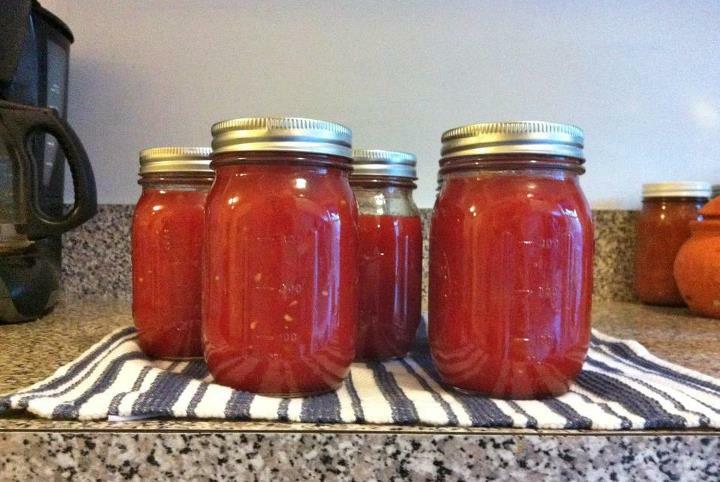 While the tomatoes are boiling, scald 6 pint jars and their bands (since you will be processing them more than 10 minutes, they do not need to be sterilized, only scalded by dipping in boiling water). Simmer the lids in a small saucepan of hot water to soften the seal. Prepare the scalded jars by adding 1 tsp. salt and ¼ tsp. citric acid into the bottom of each. 5. Ladle the hot tomatoes into each prepared jar, leaving ½ to ¾ inch of headspace. Wipe the rims with a clean, damp cloth, set the lids, and screw on the bands fingertip tight. 6. Place the jars into a large pot filled with water to cover the jars by about 3 inches. Bring the water to a boil and process the tomatoes for 40 minutes. Since the tomatoes process for such a long time, this can be a problem if water splashes out during the processing. If at any time the tops of the jars are not covered with water, you need to delete the time the jars were not totally submerged, add water, bring back to a boil, and begin timing again, making sure to restart the timer from the last time at which the jars were totally covered. 7. Turn off the heat and let the jars sit in the water for 5 minutes or so. Remove the jars and let them rest on a dish towel on the counter. Cool for 8 hours or so. When jars are completely cool, check the seal by removing the bands and attempting to lift the jars by the flat lids. 1. Pour the strawberries into a large, deep pot and bring to a boil over medium heat. Once they are boiling, add the sugar and stir until it is dissolved. The sugar tends to burn on the bottom, so keep it moving until it is thoroughly dissolved. Bring back to a boil and add butter. Turn the heat down to medium low and boil gently for 40 minutes, until thickened into a soft, loose jam. Stir in the balsamic vinegar. 2. Bring 6 half-pint jars and their bands to a boil in a large pot of water fitted with a rack. Boil for 10 minutes. Remove the jars from the water. 3. Bring the lids to a simmer in a small pan of water to soften the seal (do not boil). 4. When jars are dry but still hot, ladle strawberries into the jars, leaving ½ to ¾ inch of headspace**. Wipe the rims clean with a damp cloth, set the lids, and screw on the sterilized bands fingertip tight. 5. Place the jars on a rack in a large pot and add enough water to cover by three inches. Cover and bring to a boil over high heat, then lower the heat and continue to boil the jars for 10 minutes. Remove the cover. After about 5 minutes, remove the jars and allow them to rest on a dish towel on the counter for about 6 hours or until cool. You may hear them making a pinging sound as the lids seal. Test the seals by removing the rings and lifting the jars by the flat lid. If the lid releases, the seal did not form. Unsealed jars need either to be reprocessed immediately or refrigerated and used within a month. *If you’d rather use pint jars instead of half-pint jars, process them for 15 minutes instead of 10. ** Eugenia Bone suggests removing the strawberries with a slotted spoon, and canning the leftover syrup separately. I like to keep the strawberries and syrup together, which generally necessitates more jars. The final product when I make it is then less jam-like, but makes a great topping for things like ice cream, with its combination of fruit and syrup. Ed. Note: She is not kidding. This stuff really is like crack. 1. Fill your boiling water canner with water, about 2/3 full, and bring to a boil. Add 2 one-quart Ball jars to your canning rack, lower into the water, and boil for 10 minutes to sterilize (or, if you have a dishwasher – lucky you! – run the jars through a dishwasher cycle, leaving them in the machine until ready to fill). Leave the jars in the pot of warm water. You can put the rings of your two-part lids in this pot as well. 2. Bring a small saucepan of water to a boil. Turn off the heat and add your lids to soften the rubber gaskets for sealing. 3. In a large heavy pot combine the sugar, cornstarch, and lemon juice with one cup water and whisk until smooth. Bring to a boil and add blueberries; the mixture will look gloppy. Smash some of the berries with the back of a spoon and return to the boil for one minute. Add the extract and liqueur, if using, and stir well. 4. Remove the warm jars from your canner and bring water back to a boil. Ladle hot filling into the jars, leaving one inch at the top (filling should be just about up to the base of the neck). Wipe the rims clean with a damp cloth, place lids on jars, and screw the rings on fingertip-tight. Place jars back on the rack in your canner and lower them into the boiling water. If the water does not cover the jars, add more until they are completely submerged. Process the jars in boiling water for 30 minutes (if you have to add more water to cover the jars, start timing from when the water comes back to the boil). Remove jars from canner, place on a towel and allow to cool for about 12 hours. You may hear them making a pinging sound as the lids seal. 5. Test the seals by removing the rings and lifting the jars by the flat lid. If the lid releases, the seal did not form. Unsealed jars need either to be reprocessed immediately or refrigerated and used within a month. If you need to reprocess the jars, the jar and ring part of the lid can be reused, but you’ll need to replace the center lid. To reprocess, reheat the filling to boiling point (as in Step 3) and then continue as before. This entry was posted in Cooking, Food culture and tagged canning, cooking, family, Farmer's Markets, food, Household organization, meal planning, preserving, recipes. Bookmark the permalink. 1 Response to Guest Post: Three Canning Recipes From My Sister, D.
Just a quick note from an experienced canner (and one who likes to expirment)… The Blueberry Pie Filling recipe, though it sounds delicious, does not conform to the USDA’s guidelines for home canning because of the corn starch. Only ClearJel (aka “Modified Corn Starch”) is designed to withstand the heat of a boiling water bath (BWB) or pressure canner. This is why everyone should be cautiously suspicious of all canning recipes–even those published by seemingly reputable sources like the NY Times. Many are passed-down from Grandma’s recipe scrapbook and haven’t been scientifically tested. That said, blueberries are acidic enough that they’re probably relatively safe and if you add the alcohol off-heat, that might help as well. This is one of those “do it at your own risk” scenarios. As best as I’ve been able to tell from my research, the main reason the USDA is so quick to discount starches is more of a quality issue and a concern about throwing the acid/base ratio off with the added ingredients. PS – The same goes for recipes with large quantities of oil in them.